If I can recommend one book in which you become so emotionally invested in, THIS IS IT! Why? I actually became so invested in the lives of these characters that I had a feeling one of the characters who was pregnant was going to have a girl, I just had this feeling, when later I realized I was only reading a BOOK, and this was NOT real life! Well, this IS that book I am recommending to read! I realized how amazing the writing is in this book, that this author is pretty darned amazing that these characters felt like ‘real life’ people! Koodles to this author, Kristy Woodson Harvey! This book is told in alternating chapters between Khaki and Jodi as they write to baby Carolina, and as you are reading each chapter, you look forward to the next, yet sometimes you don’t want the one you are reading to end. You want that character to keep talking. The chapters in which Jodi talks, you can really hear that southern accent the way it is written. This grows on you, too, and you definitely knew who was talking in which chapter! This book is about Khaki and Graham who could not get pregnant with a second child they wanted so terribly. They had Alex, from Khaki’s first husband, Ben, who passed away. She met and married Graham, who happened to be a cousin to nineteen year old Jodi. Jodi ended up getting pregnant by her abusive boyfriend, Ricky, but she had no possible way in this world to be able to raise this child, and she knew it, too. Despite Jodi thinking she wasn’t very smart, she was much smarter and wiser when it came to ‘life’ than what she would even give herself credit for. Jodi is a realist. Rose colored glasses were not in her vocabulary, nor did she know what they were. She faced life head-on, bravely, and with a vengeance. Jodi was an alcoholic, living with her mother and her mother’s new boyfriends every time the wind blew a different way, in a trailer park, drinking like fishes, including Jodi, that Jodi didn’t know how she even grew up safely if it wasn’t for her Grandma. The saddest part was Jodi did not want to raise her child like that, or even near it, but how could she possibly change that fact? She couldn’t, so she was going to have an abortion. Khaki and Graham tried everything known to man to try to get pregnant. Khaki was a little sad when someone like Jodi got pregnant, yet she could not. She had no problem getting pregnant with Alex, so this sure did baffle her to no end as to why she could not get pregnant with Graham. Khaki is an Interior Designer, and every one of her chapters starts out talking about design as it relates to the story she is telling to Carolina. She has an apartment in expensive Manhattan that she flies to every every other week, and in-between her home is with Graham and Alex in North Carolina. Graham and Khaki decided they would help Jodi with Carolina, and Jodi was all for it. Later they approached Jodi about adopting Carolina, and she could still be a part of her life with them. 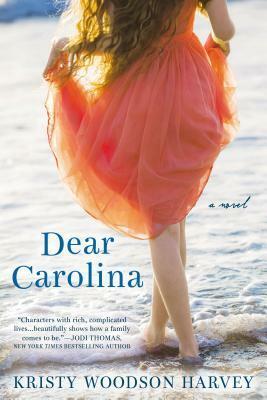 It seemed simple, but it was still hard for both of them, issues popped up with Carolina’s father. but there was one thing they both agreed on completely, and that was, ‘you can never have enough people who love you’. Again, I HIGHLY recommend this book! You will get lost inside of it, and maybe you’ll do what I did and mix up reality with fiction! And so many more! Read this one! I received this book for review purposes from the publisher, Berkley, in exchange for an honest review. Thank YOU, Kristy! This is one special book! Wow! I have never mixed up reality with fiction before, at least not until this book! I had a good laugh at myself when I did that, but it is SO EASILY done! Your writing is AMAZING! Thank YOU! I'm glad you liked my review, but it is about your writing, your book, which I cannot recommend MORE highly! Everyone should read this special 'love story'! It sure left a mark on my heart! Thanks for spotting this review SO FAST! Wow! I just got done leaving my review at Amazon and it did not surprise me to see there are 86 - 5 Star Reviews and only 2 - 4 Stars! This shows you write beautifully and pretty darned AMAZING! Thank YOU!!! I'm SO happy we met, too!! Sending you lots of love back! SO sorry! I just 'NOW' saw your comment, otherwise I would have responded a LOT sooner! Yes! This book was wonderful to read the way this author wrote it! It really does give the perspective of both of their lives, separately, and together., which is nice. I loved this story.